Here is a little secret, you will not find some of the best gaming chairs available from your favorite retailers. The reason is that they are available by ordering directly from Secretlabs themselves. The great news is that they can be ordered from people in over 40 countries including the US, Canada, UK, Europe, Australia, Singapore and Malaysia. Secretlabs was founded by two competitive gamers that wanted a gaming chair that filled all their needs. It needed to be comfortable during long hours of use, made of top quality materials and looked great in any gaming or office setup. They also wanted their chairs to be easily available to purchase and without the added markup from selling through a retailer. Lastly they wanted to a great guarantee and warranty as well as awesome customer service and support. There are over 1,000 user reviews on their site from verified buyers with mainly 5 star ratings. See for yourself here. The lineup consists of three series, the Throne, Omega and Titan. Each series is designed to provide the utmost in comfort for people of a certain height and weight range. There is a handy sizing guide that will let you know the perfect model based on your own values. After selecting which series is the perfect fit for you, you then can choose the upholstery and color that you want. The site is easy to use and even provides a 360 degree view of your chosen options. 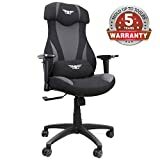 Secretlabs offers a 2 year warranty all their chairs.